"The Great Valley! I found it! I fo-ou-und it!" Sarah, Ms. Sassy-Pants Dinosaur. I made this for my youngest daughter when she turned 3 (almost 3 years ago). At the time she ate, breathed, and slept dinosaurs and The Land Before Time stories. There was no question her cake was going to be a dinosaur cake, but I didn't want a scary, toothy dinosaur cake, which is what I kept finding when I looked online for ideas. I decided I wanted to do a softer, gentler dinosaur cake, and came up with this idea. This cake actually served two purposes. 1. Birthday cake. 2. At the time, I was trying to get onto a new reality-type cake show that Buddy Valastro from The Cake Boss was going to host. Part of the audition was to submit a video of yourself making a cake. It had a limit of 5 minutes (really?? ), so my video had lots of editing, and still was a bit longer. In the end I didn't get picked for the show--I think I was probably too normal--and after I saw the first episode I was so incredibly, eternally grateful. I would have been absolutely horrified if I'd been picked for the show because it wasn't exactly the same type of show the producers led me to believe it was (guess that really shouldn't have surprised me). Anyway, I'm going to share that video. Be very, very kind, I was really nervous and you can definitely tell at the beginning of the video. I loosened up a bit as it went on, as you will see when I start making the palm trees. And eating the palm trees. Click HERE to watch the video. And remember...be kind. I followed her recipe almost exactly, only increasing the sweet factor a bit. My 2 little girls don't like syrup (I know, how is it even possible?) and eat their pancakes and waffles plain most of the time, so I increased the sugar (changed from her use of honey) from 2 tablespoons to 4 tablespoons. Not a huge increase, but enough. Desi also suggests that you can also use this recipe for pancakes. I didn't try it, but I totally believe her. Crispy on the outside and perfectly fluffy on the inside. Yum! I was so, so, so happy with how the waffles turned out. Before I cooked a single waffle I could tell they were going to be great just by how the batter looked: thick, but not too thick, and nice and smooth. We ate some for breakfast (OK, for the sake of the pictures for this post, I was forced to eat a few more for the photo shoot.) and then froze the rest. I froze them just like I do my extra pancakes: single layers on a cutting board with waxed paper in-between each layer (I started using the waxed paper after 1 too many pancakes stuck together while freezing). When they are frozen through, just peel them off the waxed paper, toss them into a big zip-top bag and stash them in your freezer. When you need a few waffles, simply pop them in the toaster and they are just as crisp as when they first came off the waffle iron. Desi has a fantastic blog with loads of recipes, free meal plans, and a subscription you can buy to her Real Foods Program, which is aimed at helping busy families cook meals with real food quickly and economically. You should definitely stop by her blog and look around. Thanks for the great recipe, Desi! 1. Combine all ingredients in the canister of a blender. Pulse a few times to start to combine, then blend on high for 20-30 seconds. Scrape down the sides of the canister if needed. Blend on high another 30-45 seconds or until the batter is thick and smooth. 2. Cook on your waffle iron according to the manufacture's directions. Serve immediately and freeze any left-overs for best quality waffles later. Makes about 20 4-inch waffles. I hope I'm not the only one who sometimes (read: often) relegates vegetables to last place in the order of meal importance. I'll even confess that sometimes I just skip the veggies altogether (which, you can be sure, doesn't make my family sad in the least). Vegetables are often an afterthought, quickly blanched broccoli or raw baby carrots straight out of the bag, instead of making them into something tasty. I also have a very hard time coming up with vegetable side dishes that go with Mexican-type or spicy foods. Yesterday I made this Corn-Potato Chowder. It's not exactly Mexican-inspired, but it is a bit spicy...and has cilantro...and I really wanted to make a veggie to go with it. I came up with this zucchini-jalapeno-tomato-cotija combination. It ended up being a really nice compliment to the soup, and I think it would go well with a variety of dishes, Mexican-inspired or spicy or not. 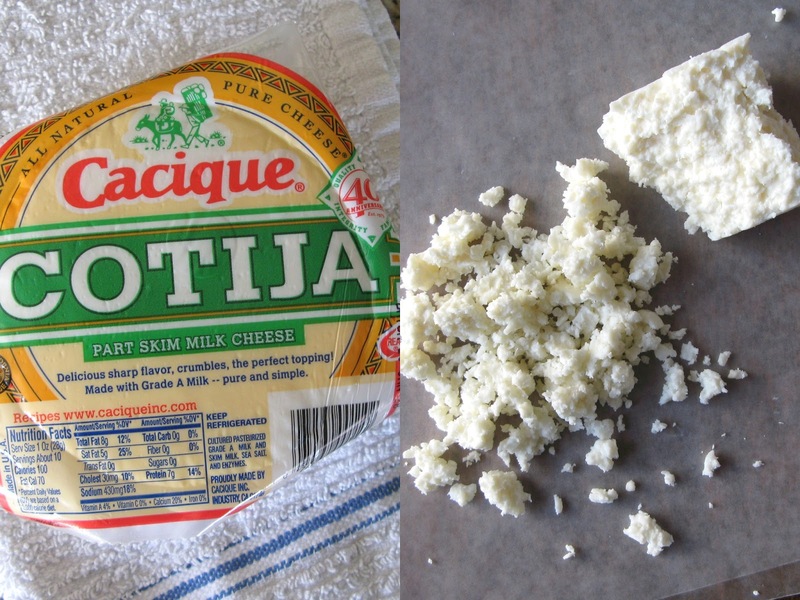 Have you ever tried Cotija cheese? It is a wonderful sharp, crumbly cheese that goes really well with spicy flavors, and it was super yummy on this zucchini. I find it in my regular grocery store in the same section as refrigerated salsa, guacamole, and ready-to-cook tortillas. It occurred to me as an afterthought that some cilantro would have been nice in this, too. If you have some, feel free to toss it in at the end. 1. Heat the oil in a 12-inch non-stick skillet. Add the onion, garlic, jalapeno, and salt, and cook, stirring often, until the vegetables are soft and just starting to brown, 5-8 minutes. 2. Add the zucchini and chili powder, and cook, stirring often, 5-8 minutes. Add the tomato and cilantro, cook for 1-2 minutes, and remove from the heat. Serve with crumbled Cotija cheese. One of the reasons why I love Facebook is that it has reconnected me with several of my high school friends that I'd completely lost touch with. This recipe is from my friend, Amy, one of my high school besties. Amy has mentioned Homemade Sloppy Joes more than a few times in her status updates, and after she made them again a few days ago I finally asked her for the recipe. It was an 'Enough! I must make these!' moment. After having my son I was sentimental about some of the favorite foods that I grew up on. I wanted to make them but, put a updated and healthy spin on the original. After seeing a Sloppy Joe recipe in the first Every Day Food cookbook, I was inspired. After seeing the list of ingredients I decided to play around with it. Adding extra shredded veggies (its a must with a picky eater) and updating it with a hint of smokiness and up the robust flavor. I doubled the Worcestershire sauce, added smoked paprika and just a small amount of brown sugar. After that combination, I never looked back! The instructions say to finely chop the veggies. To make the job super easy I coarsely chopped them and then finished them in my food processor. Just pulse 2-3 seconds a few times, scrape the sides, and then repeat 3 or 4 times until the veggies are finely diced and pretty consistent in size. Stop before you make veggie mush. Sometimes Amy adds shredded carrots or zucchini to the mix, so feel free to mix it up a bit if you want. Note: For the Worcestershire sauce, chili powder, and brown sugar, I suggest you start with the smaller amount and then add more after you taste it. You can always add more, you can't take it out. My Sloppy Joes were a little sweet this time, so next time I'll use less--or even no--sugar. 1. Heat oil in a 12-inch non-stick skillet over medium-high heat. Add the onion, celery, bell pepper, and garlic; season with salt and pepper to taste. Cook, stirring frequently, until the vegetables are softened, 5-7 minutes. 2. Add the ground beef and cook, breaking up the meat with a wooden spoon, until it is no longer pink, 6-8 minutes. 3. Stir in tomato sauce, ketchup, Worcestershire sauce, chili powder, and brown sugar. Bring the mixture to a high simmer, cover, reduce the heat to maintain a low simmer, and cook, stirring occasionally, until thick and rich, 20-30 minutes. 4. Season with more salt and pepper if needed. Spoon onto toasted buns, into baked sweet potatoes, or over soft polenta. Makes 8 1/2-cups servings of the meat mixture. 1/2 cup mixture: 3 Weight Watcher's Plus Points. 3/4 cup mixture: 5 Weight Watcher's Plus Points. 1/2 cup mixture: 175.5 cal; 10.9g fat; 7.2g carb; 1.1g fiber; 11.4g protein. It's been quite a while since I shared one of my decorated cakes, and I've decided I'll post one each weekend for fun. Maybe you'll even be inspired for one of your own cakes! I made this Rack Track cake a few years ago for my nephew. It was such a fun (and easy) cake to make. This was before I learned anything about taking pictures of food, so some of the details are washed out by the flash...oops. I started with a 12-inch two-layer round cake, and carved it to the shape you see. I frosted the sides with chocolate buttercream and piped the green buttercream 'grass' with a grass decorating tip, #352. I love to add rainbow nonpareils to grass when it's a fun cake or kid's cake. You can kind of see them if you look closely. The race track is black buttercream with black decorating sugar on top. I found the little cars in the party section of Target. My favorite part is how two of the cars are wiping out ;) I made the finish line, stadium, and flags out of card stock attached to lollypop sticks. Tip: The best way to get black buttercream is to add black food coloring to chocolate buttercream. You'll use a ton less food coloring than if you started with white. Remember when I said my husband came with a dowry, and that part of that dowry was a very nice cookbook collection? This recipe is slightly adapted from one of those cookbooks, called Dad's Own Bookbook by Bob Sloan. This book is full of fantastic recipes that are broken down into baby steps so even a novice cook can prepare great food. Besides delicious recipes, it also has lots of very useful information about different foods, meats, timetables, etc. If I was going to buy a cookbook for someone just starting out, this would definitely be on the short list. I've made this slightly adapted version of his Chicken Tortellini in Tomato-Cream sauce several times (once I even used it as a main dish for a dinner I prepared for over 50 people, and it was perfect). It's just slightly adapted in that I use cheese tortellini instead of chicken tortellini, I use half and half instead of heavy cream, I use bacon instead of prosciutto, and I quadruple the ingredients because its original proportions are for a dinner for two. OK, maybe that's more than "just slightly adapted", but I don't really feel like I've reinvented the dish. This recipe is fantastically easy and fast, and very hard to get wrong. 1. Heat a large pot of salted water to boiling, and cook tortellini according to package directions. Drain, reserving 1/2 cup cooking liquid, and return the tortellini to the cooking pot. 2. While tortellini is cooking, heat a 12-inch non-stick skillet over medium heat. Add the bacon and cook, stirring often, until crisp. Add the garlic and cook for 1 minute. 3. In a medium bowl, combine 1/2 cup of the tomatoes with the half and half, and mix well. Add the mixture and the rest of the crushed tomatoes to the skillet and bring to a high simmer over medium-high heat. 4. Add the peas, salt, and pepper to taste. Reduce the heat to maintain a low simmer, and cook until thickened, about 5 minutes. Add the sauce to the tortellini and stir gently to combine. Add a little bit of the reserved pasta cooking liquid if the sauce is thicker than you want. Serve with shredded Parmesan and chopped parsley, if desired.